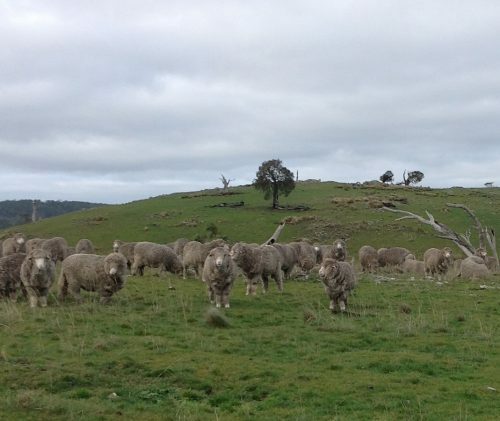 This wasn't a real shepherding day-just a move into the Basin Grazing Area from the White Gum GA. The flock made it extremely easy--they had put themselves into the top of Waterfall Gully, through the gate I left open a few days ago, when I put them in at the bottom of the gully. There was a cutting sou'easterly wind this morning, just the right direction to pull them across the undeniably soggy flat and into Waterfall Gully. I confess I was sure they wouldn't cross the flat--just goes to show how many ways it's possible to assume wrongly about sheep behaviour! They were resting and ruminating when I got there in the Polaris, so I didn't try to move them. I just re-jigged the gates so they would have to end up in the Basin when they left. Maybe 15 minutes later, as I was finishing up my "sweep" of White Gum GA to be sure no one was left behind, I saw the sheep on their way out of the gate, spreading out and putting their heads down to graze in the fresh forage of the Basin. It's been about 5 weeks since they were here, just before the big June rains started, so no doubt it looks like a world made fresh and new. Part of my plan in moving them into the Basin now is that I need to take a few days off to rest my right ankle, which has been acting up for the last few weeks. I think I've awakened an old injury, and although it gets better in between shepherding days, it keeps flaring up, especially on full days over rough ground. I figure the sheep will be perfectly happy to graze unmolested for a few days in the Basin. The only downside to this is now I have no excuse not to get stuck into housework I've been putting off! All going well with the ankle, I'll be back shepherding a week from now. P2: Watching me curiously–the dogs are well back behind me, in the Polaris, so the sheep know they don’t have to do anything unless they darn well want to. That’s Annie on the right in the front row. Honestly, they made it clear they had no interest whatsoever in following me back out the gate. But they must have been watching, and thinking about it, because it didn’t take them more than 15 minutes at the outside to come poking over to see what might be happening at the gate! Into the Basin Grazing Area. They made my job really easy by drawing into the top of Waterfall Gully in the SE breeze this morning before I got there. All I had to do was re-jig the gates so they came out in the Basin. No shepherding now for a few days as I rest my ankle which has been playing up.